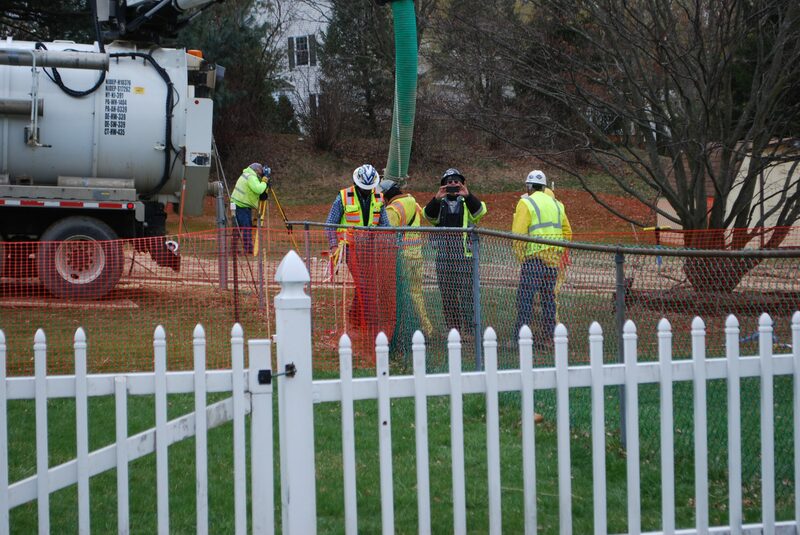 In this May 2018 photo, workers and contractors for Sunoco Pipeline investigate sink holes behind homes at Lisa Drive, West Whiteland Township, Chester County where the company has been drilling for construction of the Mariner East 2 and 2X pipelines. The company offered to relocate residents of the five homes whose yards are crossed by the pipeline right of way. Because of permit violations, construction of Sunoco’s Mariner East 2 pipeline was halted last month by the state Department of Environmental Protection, which said the company must meet certain conditions before it will be able to resume work. On Thursday, the DEP allowed Sunoco to begin construction in Chester County. DEP approved Sunoco’s Water Supply Restoration Plan and said the company has met requirements to resume drilling, the statement said. Sunoco must provide notices to the DEP, the townships and landowners who have water supplies within 450 feet of the drill, and must receive the agency’s written authorization. DEP did not say in its statement what terms Sunoco had satisfied. Sunoco spokeman Jeff Shields said the consent order contains a requirement that Sunoco will immediately provide bottled water to any resident who had not previously been connected to a temporary water supply and who reports a complaint when drilling restarts. On Feb. 8, DEP lifted a month-long ban on Mariner East 2 construction related to permits it had issued — a stoppage imposed after dozens of environmental violations by Sunoco or its contractors. The department said it would ensure that Sunoco would comply with permit conditions going forward, and issued a $12.6 million civil penalty, one of its largest. In West Whiteland, the earlier horizontal directional drilling (HDD) punctured an aquifer and caused water from some private wells to turn cloudy. After the halt to drilling, Sunoco offered to pay for affected homeowners to be connected to public water supplied by the local utility, Aqua. David Mano, a West Whiteland resident whose well water turned cloudy during the summer, said he had declined Sunoco’s offer because he prefers his well water. “Why does everybody on public water go out and buy bottled water from the grocery store? Because they don’t want to drink their tap water,” Mano told StateImpact. He said he would wait to see if the well turns cloudy again when Sunoco restarts drilling near his house, and if it does, he said he might seek a court injunction to get the drilling stopped again. He said he is the only resident in his community to reject the public water hook-up. On Wednesday, Mano received a letter from a Sunoco land agent proposing that his home be connected to a water “buffalo” – a large portable tank – that would be installed and maintained by Sunoco when the drilling restarts and “for the entire period” of the drilling, the letter said. The letter indicated the offer was made to landowners with water supplies within 450 feet of the drilling. But Mano rejected that offer, saying he doesn’t trust Sunoco to supply clean, drinkable water. “Sunoco can’t force me off of my well, they can’t force me to take public water, and they’re not going force me to put a water buffalo on my property,” Mano said. He said the DEP appears to have approved the restart after learning that all of the affected residents – except Mano and his partner Diane Salter – are now on public water. He predicted that the drilling will again cause his well water to turn cloudy. Ginny Kerslake, who lives across Shoen Road from the drill pad, said she’s not happy with the decision to restart drilling because Sunoco hasn’t completed a public water connection for one of her neighbors, and has not stopped flooding on her property which began after the company stopped drilling in the summer. “They still have unresolved issues related to the July accident,” she said.